* Chris MacDonald’s Jukebox Memories. Trust Jeff Eats on this one…this is gonna be a terrific show! 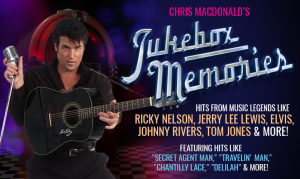 For one night only, accomplished tribute entertainer, Chris MacDonald, will bring the memories and music of legendary Jukebox Icons of the 1950’s and 1960’s including Ricky Nelson, Elvis, Jerry Lee Lewis, Chuck Berry, Johnny Rivers, Tom Jones, The Turtles, Van Morrison, Neil Diamond and many more. Chris has thrilled audiences throughout the country with his MEMORIES OF ELVIS tribute production show. With this new production, you’re in for a fun night of classic Rock-n-Roll songs performed with a rockin’ live band including “Hello Mary Lou,” “Travelin Man,” “Garden Party,” “Great Balls of Fire,” “Whole Lotta Shakin,” “Chantilly Lace,” “Rockin Robbin,” “Johnny B Goode,” “Sweet Little Sixteen,” “Don’t Be Cruel,” “Blue Suede Shoes,” “Can’t Help Falling,” “Suspicious Minds,” “Memphis,” “Secret Agent Man,” “Seventh Son,” “Poor Side of Town,” “Delilah,” “Kiss,” “What’s New Pussycat,” “Green Green Grass of Home,” “Sweet Caroline,” “Happy Together,” “Brown Eyed” and more. Join us for a fun night of JUKEBOX MEMORIES as we celebrate some of the singers and songs on our good time oldies playlist!